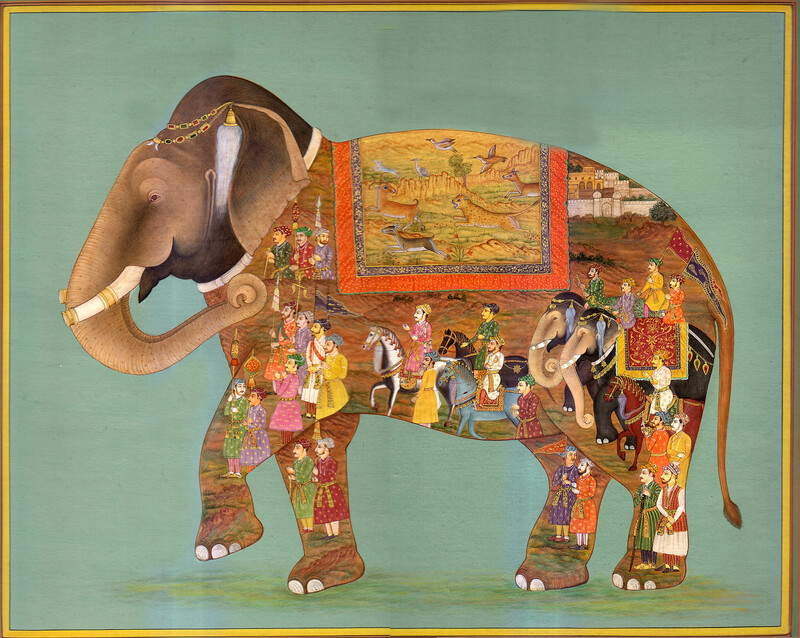 Lakaji the Elephant Elder, was the oldest elephant that lived and strode along the dusty pathways and brittle woods and tall tree forests of the twelve villages the princely province of Nawanagar, overlooking the Gulf of Kutch, north of the Arabian Sea, in the Indian state of Gujarat. Randhava the Elder, was the venerable chief of the twelve tribal villages of Nawanagar and beloved by all. As a child, he would ride playfully on the back of the young elephant Lakaji, who was now elder to his own clan of Nawangar elephants. Lakaji and Randhava had grown up together and grown old together. Those were lush and fruitful days, full of soft rain and rich green grass, unlike the parched and scorched drought that now cursed the villagers of Nawanagar. The health of the village cows and the fruits on the trees and the wheat in the fields were all withering now. The Prince of Nawanagar had fled with his family to his vacation palace in the sumptuous and mildly temperate hill station of Shimla. Lakaji the Elder had also fled with his clan of Nawangar elephants, to the forests of Gir, where the vegetation was still lush and the elephant clan could survive the merciless heat of the relentlessly hot sun. Randhava the Elder felt his heart heavy with sadness as he watched his beloved people withering and dying. He felt helpless and he prayed to all the gods for an answer to his woes. The two sacred rivers of Nawanagar, the river Nagmati and the river Ragmati, were running dry. The old men of the village meditated quietly by the riverbanks and prayed to the ancestors. It was said in the scared Pauranik texts that the ancestors of the Nawanagar villages were sired from Dwarka, a village that was created by Lord Krishna himself, when he had arrived from Mathura. Meanwhile, the young men of the village, including Raj, the eldest son and heir to Randhava the Elder’s legacy of village elder, began to plot and plan. They brought their plan to Randhava the Elder, and he listened to their plan patiently. Randhava was not at all surprised by the proposition his son Raj, and the other young men of the village had brought to him, as they all sat crossed legged under the shade of a Bodhi tree. However, what did certainly surprise Randhava was the Lee-Enfield repeating rifle that his young son Raj, had obtained and held guardedly by his side as they all sat under the shade of the tree. What surprised Raj and the other young men, is what his noble father Randhava had by his side, as he remained seated. There were two very large metal vats filled with fresh drinking water and neatly stacked piles of British army ration canned foods. This was certainly enough food and water to sustain their village for at least a week, if rationed frugally and prudently. Raj spoke first, for he was the natural leader of the young men of the village and they all respected him and looked at him admiringly as he spoke. Raj explained to this father Randhava that the entire twelve villages of the province of Nawanagar had run out of options. There was nothing left to do except to perform the most hideous act of violence and cruelty that Raj already knew would upset his father deeply. They had no option but to murder all the elephants of the province of Nawanagar, including his father Randhava’s beloved childhood friend, the now venerable Lakaji the Elder. “You are going to kill by beloved elephant friend, Lakaji the Elder?” lamented Randhava the Elder, with such heaviness in his voice and an ache within the depth of his soul. “I understand,” said Randhava the Elder, soberly, sadly, and then he began to quietly weep. The young men waited patiently and respectfully until Randhava the Elder had composed himself. He then asked his son Raj what their plan was once they had killed all the elephants. Raj then explained to his father, in a very methodical way how the young men had made arrangements with a British army officer to have the officer and his manservants meet Raj and his men at the forest of Gir, in order to collect the ivory from the elephant slaying and slaughter and then load up the ivory on a British army land rover and transport the ivory to a smuggler in the neighboring province. It was all arranged, explained Raj, confidently and succinctly. Since it was against the Imperial Law for British officers to kill elephants themselves, the British officer had been considerate and trusting enough to lend to Raj his own personal British army standard issue Lee-Enfield repeating rifle, in order that Raj may kill the elephants efficiently. Randhava the Elder’s eyes began to well up once more and he lowered his head in grief, staring down at the hot dust, from which nothing good grows and because of which his people were beginning to starve. The only moisture in this sweltering heat was provided by the gentle, soft tears that splotched and splattered upon the dry dust from Randhava the Elder’s eyes. It was then that Randhava the Elder explained that he too, had gone to see a British officer, a man whom he had known for many years. He had taken to this British sahib, all of his late wife Nilufer’s gold bangles, and all her jewelry and all her dowry, and exchanged it all for a week’s worth of rations of food and water for the entire twelve villages. Randhava the Elder patted the rations of canned food beside him and explained that these rations were just for their village and other rations had been delivered to the other villages in the province of Nawanagar. After all this talking and explaining, a deep and somber silence befell all the men. All became quiet, as it was time for Randhava the Elder to arrive at a decision in response to the plan of his son Raj and the other young men of the village. This plan, which seemed the only remaining option, as Raj had explained, was going to save the twelve villages in the province of Nawanagar from certain starvation, probable disease and an untimely death. “Young men, I cannot give you my decision and my approval and my blessing until I first visit the forest of Gir and visit with Lakaji the Elephant Elder, and pay this venerable elder my deep respects. “I shall leave this afternoon and make my trek to the forest of Gir and meet with my fellow Elder, Lakaji the Elephant. I shall then return by tomorrow at this time, when we shall all gather here once more, and I shall then give you my final decision. Randhava the Elder returned home to his village and met once more with his son Raj and the other young men of the village to offer his final decision on the plan that they had presented to him. Raj and the other young men sat patiently on the dusty ground beneath the Bodhi tree as they awaited the final decision and anticipated the blessings of the venerable and venerated Randhava the Elder. The young men nodded to convey that they understood. 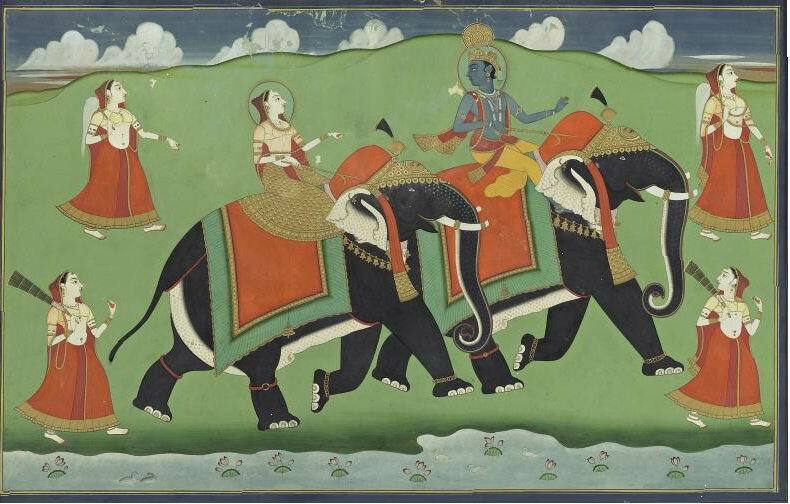 “I have spoken to Lakaji the Elephant Elder, and he has told me he is embarking upon a three day Great Trek from the forest of Gir to the Grand Trunk Road and then to the depth of the Sacred Forest. Lakaji the Elephant Elder would like my son Raj to accompany him on this Great Trek and share the legacy of his elephant clan with Raj. Three days into the depth of the Sacred Forest and then three days back means that you will be gone for six days total, Raj. Raj and the other young men became quiet and thoughtful for some time as they pondered this most unusual proposition. So it was decided and so it happened that Raj left that same day to go to the forest of Gir and to accompany Lakaji the Elephant Elder on his six day Great Trek deep into the Sacred Forest and then back again to the villages of Nawanagar.